What a peaceful, relaxing, stress free getaway! Our second stay. Lovely view, accommadations. Only suggestion is screen doors for front and side door. Keep flies out & when nice weather can open windows for a lovely breeze. Staff at Eastern Vac Rentals are always helpful!! We just stayed at Simplicity cottage and thoroughly enjoyed our stay. The property is on the river and is so nice and quiet. The cottage is completely charming and well-equipped with everything we needed. We are already planning our next stay!!! I was pleasantly surprised by how close the cottage was to the water. Beautiful views from the cottage. So close we could hear the waves against the shore. Beautiful sunrise on Saturday morning. Very serene and private... a wonderful weekend escape. Exceeded expectations. Great place to relax and enjoy the surroundings. We greatly enjoyed our weekend at Simplicity cottage. 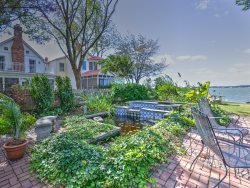 The peacefulness, serenity, and the outstanding view over the Choptank River were ideal. Quite a pleasnt change from the Beltway routine. lovely property - the flies were an annoyance, and the location was a little too residential for us. Simplicity at its finest. Enjoyed waking to the sunrise over the water and seeing the watermen crabbing. Then the moon over the water at night. Great biking, walking and running. Great food and fun at Tilghman Island Inn. The Bridge Restaurant was terrific -- great service excellent food - Smith Island cake out of this world. Good breakfast at Two If By Sea. What a view--what a lovely renovation. We crabbed, kayacked, fished, went boating,grilled & napped in the hammock and sat out under the stars. The owner thought of EVERYTHING in the kitchen and was generous in allowing us to use all the amenities you always pay extra for. We couldn't have been more pleased. All we really desired was to see pics of the original cottage and know the history! We hope to return! The owner may consider getting a phone where you can cut the ringer off. The phone rang all hours of the day and night; we eventually shoved them in the couch cushions. Its the smallest of things -- and did not dampen our stay. I look forward to returning. Wonderful visit. The home had much more than we expected. When we drove up to the home, we were thrilled with the location. When we entered the home, it was so much more than we expected. The house is awesome, very clean and has many amenities such as a fire pit by the water, bikes, paddle boards, crab traps and even a croquet set. We had planned to do a lot of things while we were in St. Michaels but found ourselves just sitting and enjoying the view. Red White and View offers all the conveniences we expected. The house is spacious, the furniture comfortable, the kitchen completely outfitted and the location great plus easy to find. I would recommend this to anyone who wants to relax and enjoy the St. Michaels area. We just used the first floor, which is the renovated part of the house, and enjoyed its comfort and ease, with nice decorative touches. We stayed here during the last week of July, 6 of us including 2 kids and 2 dogs. Very family friendly location and great for dogs. Walked to the beaches, park and shops. Did a lot of biking, kids had a great time fishing and caught crabs, fish and even a sting ray! Oxford is a very small town, but it was perfect for a relaxing getaway. Most sidewalks are brick and just walking around town looking at all the houses was enjoyable. We took the ferry to St. Michaels one day. Drove 1.5 hours to Ocean City one day. But, the most fun was just hanging around the town of Oxford and enjoying the sights, swimming, fishing, etc. This house has a great dining room/table, had nice family meals. AC worked great in the house, was hot outside during our stay, so we weren't able to open windows, but didn't notice any noise distractions. House is in a perfect location. House is in need of a deep cleaning, saw cob-webs, soiled area rugs, etc. Eastern Shore Rentals is a great company, very polite and answered all my questions. We had a non-usable grill and within a couple of hours they had a replacement delivered. Would definitely book through this company again. This is a neat old house, lots of charm and character, little spaces and nicely remodeled - well maintained and appointed. The sleeping arrangements worked great for our group of six adults and two kids and one little dog. There are just a few things that need to be fixed to make this a great stay. Ants! It was very hot over 4th of July weekend so no doubt the ants were more active, but, pretty much everywhere in the kitchen, there were ants. You couldn't put any food down on any location without the ants finding it. There were traps out, so clearly it is a known issue, but then we had to make sure we moved all the traps from where the dogs and kids would play. The ant issue really needs to be resolved, I wouldn't stay there again so long as it had this issue.Doors stick - a number of the doors are really difficult to open or close properly, including the one to the patio and the one from the guest room to the bathroom. It loses its charm once you spend 5 minutes trying to get a door open or closed. Guest room bed ist kaput. The mattress is really saggy and uncomfortable, frame is old and bent plus it is right against the wall and makes sleeping for two uncomfortable. The family room could use a big wrap around sofa rather than the small love seat and chairs - with more than 4 people we found it uncomfortable to hang out together in the family room - people had to sit on the floor.Despite these minor issues, we had a great stay at Red Shake and suspect you will too - just make sure the ants aren't joining you for the weekend. We thoroughly enjoyed our visit in this home, that was full of character. The rooms were spacious. We congregated for family dinners around a large table in the festive dining room. We had 3 generations together to celebrate our son's birthday. Everyone loved the town of Oxford. We were able to walk everywhere. The water scenes are relaxing. We took a day trip to St Micheal's. We have many, many happy memories. Thank you for allowing our dog. I would definitely recommend this house. It would be a geat place to share a holiday with family. Secluded in the very secluded Oxford, this house is comfortable, and quiet, conducive to relaxation. The management company is very good, quickly responsisve to any questions, and all-around first-rate. Loved the location and lazy atmosphere. Great place to relax with the most delicious seafood nearby. This vacation brought a little of everything, snow, sunshine for walking around town, good friends and family! After a rough start ( no cable for NCAAs or internet) Jessica got everyyhing settled and we really enjoyed The Red Shake Cottage. If you have animals be aware that the property is not totally fenced as advertised.